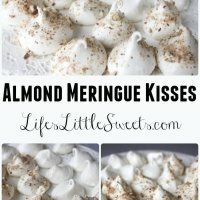 Almond Meringue Kisses: The wonderful thing with this recipe, is that this it yields quite a few cookies, (depending on the size you pipe them), so be sure to share them with friends. I usually make meringue cookies after making tiramisu because I have leftover egg whites. In my tiramisu recipe I use six egg yolks, so of course, I am leftover with six egg whites, hence, that’s how this recipe developed. I have made meringue cookies using smaller amounts of egg whites and I found that I was running out of delicious, delightful cookies too fast. 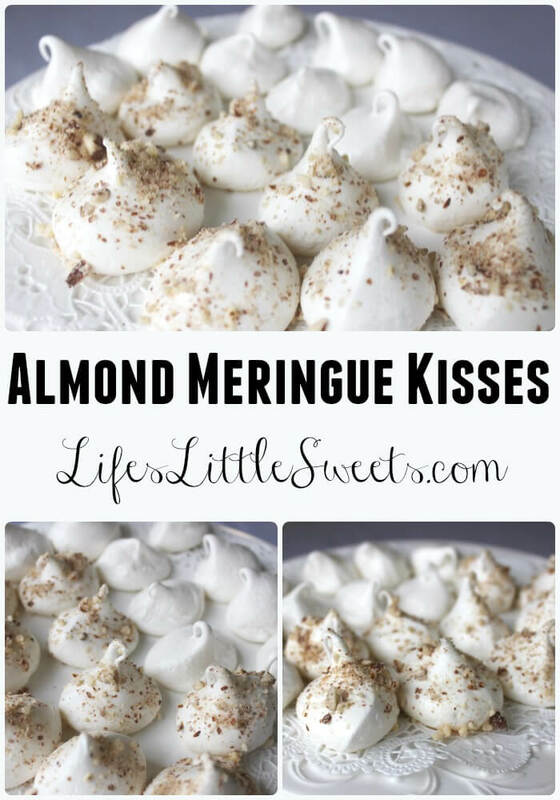 I have noticed that people really enjoy meringue cookies or in this case, “kisses.” There is something nostalgic about them, people will say they had a relative that made them or they used to get them from some place. It is nice to have food that makes you stop and reminisce about the past. How special is that? If you make this recipe, please share your results in the comments below. Thank you! *I make my own caster sugar by putting it in my food processor for about a minute. Place racks in the center of your oven and preheat to 200°F. Line 2 baking sheets with parchment paper. Using a food processor grind the 1/4 cup of whole raw almonds until they are a desired ground for sprinkling, set aside. Using a stand mixer, make sure bowl and whisk are clean of any grease (this is very important to ensure a successful meringue). On low to medium speed, whip egg whites until foamy. Add the 1/4 teaspoon cream of tartar and whip until you reach soft peaks. SLOWLY add the sugar. Whip mixture until you reach stiff peaks (click here to see a visual guide on whipping meringue). **Make sure the sugar is completely dissolved by rubbing the mixture between your fingers, if it feels sandy then keep whipping. ** Add the almond extract. Using a pastry bag with a 1/2 inch tip or just a gallon size zip lock freezer bag, fill the bag with the meringue, carefully, using a baking spatula. *Before piping the kisses, put a dot of meringue under the corner of the parchment to keep it from sliding, this acts as a "glue." If using a freezer bag, cut 1/2 wide opening in one of the corners after you are done filling it with the meringue. Pipe the meringue kisses onto the 2 baking sheets. You can make them whatever size you prefer. I suggest making them about 1-inch give or take a little, so they are "bite sized" and plentiful. Bake the meringue kisses for 1-1/2 to 1-3/4 hours. You might want to rotate the sheets 90 degrees to ensure even baking but do this after the first half of the baking is done so that they do not crack. I personally, never had to rotate them but everyone's oven is different. You will know they are done when they easily release from the parchment, they should also be pale in color and crispy. When they are done, after you have checked them, turn off the oven, leave the sheets in the oven and let them dry out overnight with the oven door open a crack. They will store in a dry, airtight container for several days. Do not store them in the refrigerator as these cookies are sensitive to moisture and will get sticky if exposed to moisture. Swap out the almond extract with vanilla or your extract of choice. 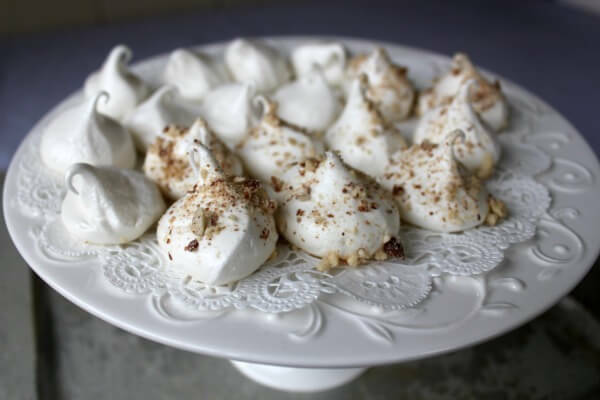 You can skip the almonds for sprinkling over the meringue kisses or you can mix them in the meringue itself or you can sprinkle on some and leave the rest plain. There is some technique involved in making a meringue, there is a good reference for making a successful meringue on MarthaStewart.com. The first meringue cookie recipe I tried was off the TheJoyofBaking.com. Those are larger meringue cookies which are great but they get eaten up really fast because they are so good. They also have a great video that takes you step by step, so you get a visual of how to make them. I would advise to watch it, especially if you are new to meringues. 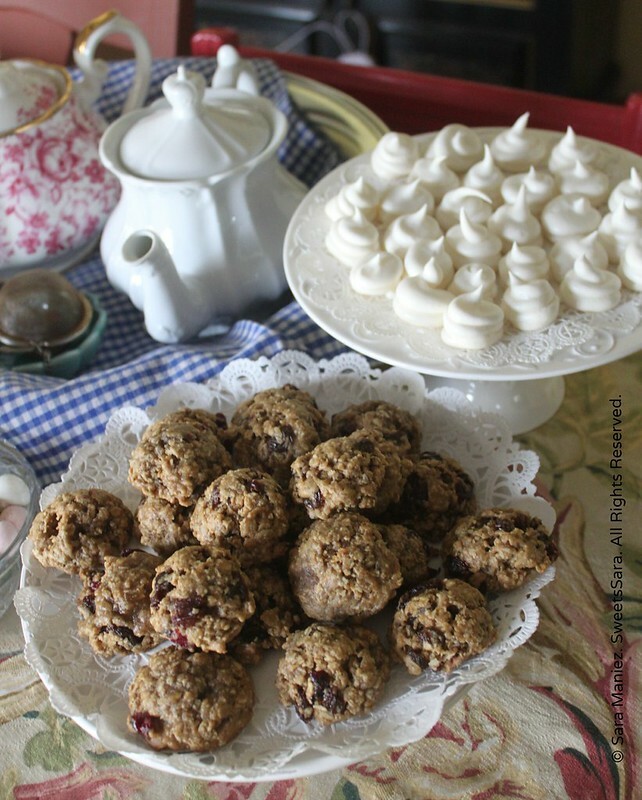 Meringue cookies make a nice accompaniment to tea or coffee. If you share on social media, be sure to #lifeslittlesweets and link back to the post, thank you in advance! Do you have any questions? Let me know in the comments below. I’m not familiar with diabetic cooking; do you mean they would need to not have sugar? I do not freeze meringues however technically you can but they need to be put in airtight containers separated by parchment paper and be careful not to let moisture accumulate as hey defrost or they will be ruined – it would be tricky.